Getting vital nutrients back into our soil. We know that “traditionally grown” fruits and vegetables we see in supermarkets are both lacking in vitamins and minerals and have added chemicals from fertilizers and pesticides. These toxic additions in particular fueled the demand for organic produce but did not completely address the lack of nutrients. Going back in time, our soil was rich with minerals, which found their way into our foods in healthy doses. Mineralized soil grew healthier crops providing the vitamins and minerals we now need to take as supplements. Additionally, hardier plants were capable of repelling insects and other pests that are now a constant and costly threat to growers. Over the years (and accelerated with the advent of modern industrialized farming), soil all over the planet has become depleted of minerals, resulting in crops and forests that struggle to perform their parts in our ecology—either providing nutrition or, in the case of trees, putting vital oxygen back into our atmosphere. It’s a serious problem. A recent report based on U.S. agricultural records has found that the nutrient content of fruits and vegetables has been dropping since these records were first taken in the early 1960s—just over 40 years ago. To illustrate the point, you would need to be eating five apples today just to get the same nutrients you would have found in one apple in 1965. Remineralized soils can provide two to four times the yield of current unhealthy soils, and greatly increase the health of plant biomass—a well-validated fact that even amazed a group of Missouri high-school students who, in conducting experiments with remineralization, watched pecan plants germinate 7–9 days earlier and grow consistently faster than non-remineralized plants. Remineralization is also fundamental in solving global warming. “When forests are unhealthy and dying off, they release carbon dioxide into the atmosphere,” Campe says. “When they’re healthy, they store carbon.” And remineralization’s effects are already being felt in this area. Highly successful remineralization on trees has been done by Dr. Lee Klinger, an independent northern California scientist. In the last three years his methods have been used on more than 5,000 Californian oak trees afflicted with malnutrition and other disease conditions, with all but a handful responding with a flush of healthy canopy growth (see www.suddenoaklife.org). Additionally, there are early-stage studies indicating that spreading rock dust can help bind up atmospheric carbon in the soil and counteract global warming. Remineralization is a straightforward procedure. Simply apply a specific fine rock dust (called glacial gravel) to a field, garden, forest, or even a planter. This type of dust creates a broad spectrum of minerals in the soil in a natural balance. 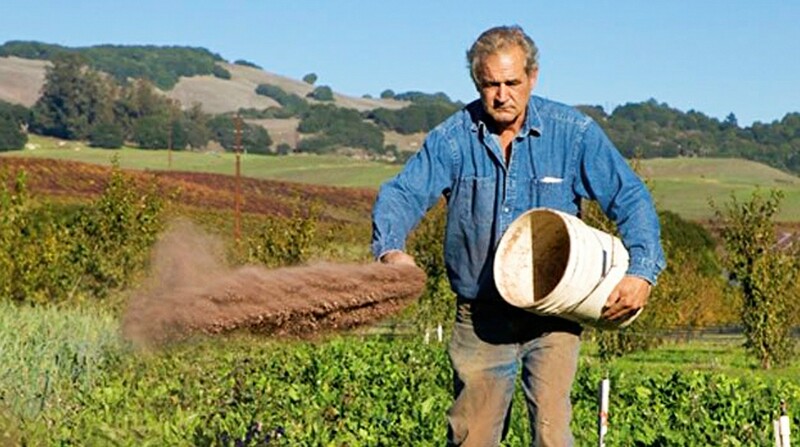 Local sources of rock dust are available as well as products that can be purchased (see www.remineralize.org). Remineralization is also far less expensive and labor-intensive than traditional fertilizing and pest control. A ton of rock dust costs anywhere between nothing at all and $8.00 and only needs to be applied every 1–10 years, depending on the application. Compare this to chemical fertilizers, which cost over $400 per ton and need to be applied at least once each season. This year, however, he had remineralized. “Under the exact same growing conditions and locations, with the exception of adding rock dust last year, the crops are now growing virtually insect free,” he reports. This kind of economic effectiveness should come as great news to the organic food industry. According to current statistics, the U.S. buys nearly half of all the organic food produced in the world, and only 0.2 percent of its farmland is dedicated to organic growing. Much of the food produced is also of suspect quality. The reasons for this scarcity and lack of quality lie partially in the expense and difficulty of growing organic food due to the poor soil. Such problems would be easily remedied by the next logical step in natural food production—remineralization—making it possible for farms everywhere to grow natural food easily and within economic boundaries. Organic growers are starting to take notice and participate in remineralization. For example, the largest carrot farmer in the world is turning over his acreage to remineralization, and remineralized carrots can now be purchased from Cal-Organic at Whole Foods Markets. World-renowned chef Alice Waters, inventor of what has become known as California Cuisine, is also an advocate of remineralization and has up to 70 remineralized fruits and vegetables grown for her famous restaurant, Chez Panisse, by Bob Cannard. You, too, can take part in this vital movement, starting right in your own backyard. First, get some education on remineralizing and the kind of rock dust you need by visiting Remineralize the Earth’s website at www.remineralize.org. Then, discover how easy it really is—with the astounding results nutritionally and otherwise—to remineralize your own area. You can also become a contributor to Remineralize the Earth and assist in their upcoming campaigns and remineralization projects worldwide. Check www.remineralize.org for the many efforts they are making to spread this vital word.